Born into a musical family Daniel began his piano studies at the age of five with his father, well-known Canadian pianist Alexander Tselyakov, before subsequently completing a Bachelor of Music degree at the Oberlin Conservatory with Angela Cheng and a Master of Music degree at the Université de Montréal. Daniel is presently pursuing his doctorate with Dr.Ning Lu and teaching at the University of Utah, USA. He has won numerous scholarships, trophies, awards and competitions including the McLellan Competition, the Women’s Musical Club of Winnipeg Scholarship Competition and the National Canadian Music Competition. 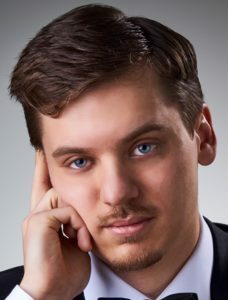 He has received full scholarships to many well-known music academies such as Pinchas Zukerman’s’ Young Artist Program, Art of the Piano Festival, Toronto Summer Music and PianoTexas International Academy & Festival. Daniel has studied with legendary mentors including Sergei Babayan, Yoheved Kaplinsky, Olga Kern, Marc-André Hamelin, André Laplante, Marc Durand, and John Perry. He was the youngest musician ever to be invited as a guest artist with the prestigious Virtuosi Concert Series and has appeared as a soloist with the Winnipeg Symphony Orchestra, the Canadian Sinfonietta, the Winnipeg Symphony Chamber Orchestra and the San Luis Potosi Symphony Orchestra, Mexico. In April 2014 he made his debut at the Kennedy Center in Washington, D.C. By the age of 12, he had performed Chopin’s Piano Concerto No. 2 as a soloist with the Penderecki String Quartet. In Europe, he has given solo recitals in Italy, France, and Spain. He is co-Artistic Director of the Clear Lake Chamber Music Festival, Canada.